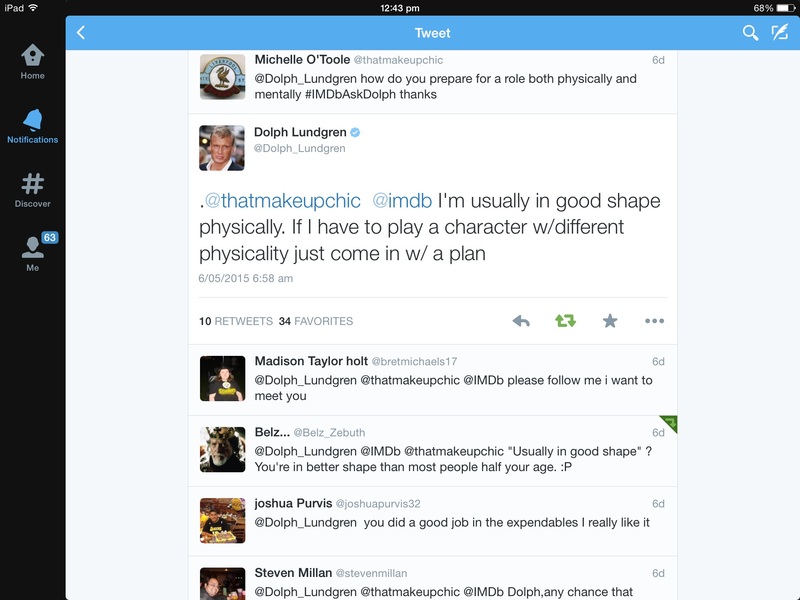 The Internet Movie Data Base ( IMDb) recently did a Q&A on Twitter with Dolph Lundgren. I was looking at their homepage at the time when the details popped up and I thought, that’s cool. I mentioned it to my husband Simon, who immediately got excited about the venture. He started ranting facts about Mr. Lundgren, such as he spent a year in Australia, in Sydney and has an IQ of 160 points. For the rest of us, 160 points puts someone in the genius category. The chat on Twitter via IMDb coincides with the release of Skin Trade. Skin Trade has been a very busy film, including viewings at international film festivals. IMDb listing for Skin Trade and relevant international release dates is informative. Dolph Lundgren is an accomplished actor, producer and director. His filmography includes Masters of the Universe (1987), Universal Soldier (1992) and The Expendables (2010). One of his most famous roles is as Ivan Drago in the film Rocky IV (1985). Dolph was born in Sweden and completed his military service there. It was during his military service that he became involved in the martial arts. He continued his interest in the discipline including becoming a World-Class competitor in Japanese Karate. Dolph’s studies, in an Engineering Degree, opened the door for him to study around the world. In 1982, he received a scholarship to complete his Masters Degree in Chemical Engineering at the University of Sydney, Australia. He met Grace Jones in Sydney and moved to New York with her. This bought about the decision to take up acting. He has since gone on to star in 30 feature films. When the opportunity arose to ask him a question, I decided to ask him about preparing for a role. The above conversation with his answer is interesting. Discipline and training that he received earlier on would have helped him establish his acting career and help him continue to work in his chosen field.